Turning great ideas into elegant, engaging solutions that people will actually want to use isn’t easy. Companies spend exorbitant amounts of time and resources creating a market-ready product, only to discover months down the road that the product isn’t user-friendly, or worse still, that it simply isn’t useful. To avoid that costly mistake, an iterative design process that favors speed, early user feedback, and collaboration are necessary ingredients for any successful venture. A design sprint is a comprehensive tool companies can use to rapidly carry an initial design idea through prototyping and user testing in just five days. A concept originally formulated by Jake Knapp and the design team at Google Ventures, a design sprint is a condensed process that orients a team of diverse minds around a single design solution and aims their efforts at hitting clearly defined goals. At Aspire, we use design sprints regularly to build rapid prototypes and get early feedback on the first iterations of our products. We recently conducted a design sprint, in a period of four days rather than the usual five, to develop a prototype for our venture MedStatix’s new consumer-facing doctor search app, M-Path. The app takes a new approach to the doctor search process by enabling cost transparency and leveraging MedStatix’s huge patient experience dataset to let users match with the right provider based on experience preferences, book an appointment, pay, and rate their experience, all from one tool. The design sprint helped us build a rapid prototype without investing too many resources, and helped us gain early consumer feedback vital to future development of the product. But while user testing and time constraints are often recognized as the primary benefits to sprints, we’ve found that perhaps the most important (and often overlooked) benefit is the utilization of a diverse, cross-functional team. 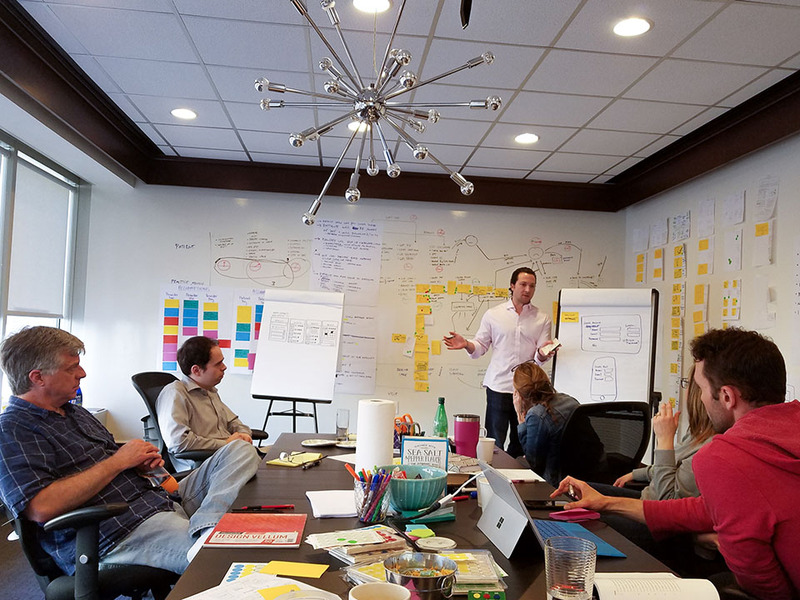 Design sprints call for a group of key players from a variety of factions within the business, including executives, stakeholders, product managers, technology engineers, designers, marketers, or anyone else with a vested interest in the project. Developing a cross-functional team can dramatically speed up the design process by breaking down silos and building early consensus around a solution. A sprint strongly encourages equal participation from across the departmental spectrum, which helps to build a stronger community that’s focused on solving the problem at hand, and ensures that the project is less likely to be derailed by dissenting viewpoints in the future. The M-path app in particular revealed the importance of involving diverse perspectives and disciplines, because the problem the app tries to solve is a complex one that involves numerous stakeholders. Building an app that appeals to doctors, everyday consumers, insurers, and hospital administrators requires a broad range of expertise. It was necessary to understand the everyday healthcare consumer’s user story; how insurance and pay structures work; how to receive buy-in from doctors; and how the intricacies of healthcare, technology, and design might work together to address the problem. Obtaining diverse perspectives at the outset of the project allowed the entire team to benefit from access to unique, on-the-ground insights specific to the product. Instead of filling the room with designers and developers only, our M-Path sprint team members included a Human Resources manager, an accountant, two software engineers, an artist, and a creative manager. The result of putting such a diverse group together not only led to better design results, it became an important way to build invaluable working relationships that advance the company as a whole. Rahe, with over 20 years of experience in healthcare administration, was able to offer intimate insights into health insurance reimbursement models and practice-centered questions like: How will it affect people? Who will pay for it? What if it changes the workflow? Design sprints have become an integral part of our venture development process. The benefits of efficiency, early user feedback, and collaboration have revealed themselves not only with M-path, but with many of our other ventures as well — and we look forward to the progress we will make with other design sprints in the future.